QMF Global Consultants, a leading international consultancy providing ISO quality assurance services, recently held a graduation ceremony to mark the successful achievement of 10 Bahrainis who qualified as IRCA-approved lead-auditors. The IRCA-approved ISO9001:2008 lead-auditor course is considered to be one of the most demanding courses in the field of quality-assurance. QMF Global Consultants is a Tamkeen-approved quality assurance services provider and therefore is able to provide further benefit to its clients as Tamkeen will pay 80 per cent of the consultancy fees and 100 per cent of the UK certification costs. For training Tamkeen will pay 100 per cent of the fee. All 10 students successfully passed the course taking advantage of the Tamkeen Professional Certification Scheme (TPCS), under which the Fund pays the fee for all Bahrainis who successfully complete the course. 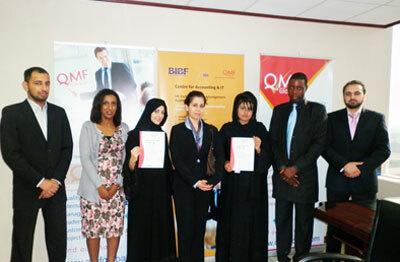 The key partner representatives of QMF Global Consultants from both BIBF and Tamkeen were also present at the ceremony. Faisal Riaz, the director at QMF Global Consultants, said the demand for these ISO lead-auditor courses has been astonishingly high. "Our next three courses are already fully-booked. The courses are particularly popular as they are worldwide recognised and accredited by IRCA in the UK. We are thankful to our partners BIBF and Tamkeen for making this possible for the Bahrainis," he added. Tamkeen's senior manager for Human Capital Development Amal Al Kooheji expressed gratitude to all parties involved in this milestone towards improving the skills set of Bahraini. "Tamkeen is committed to closing the gap in the labor market and making Bahrainis the employees of choice. The overwhelming interest in our programmes and initiatives, including the Professional Certification Scheme, is a testament of our success in realising our mission," she remarked. "To date, more than 40,000 Bahrainis benefited from Tamkeen’s human capital development programmes," said Amal.